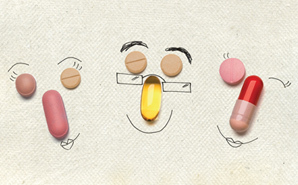 Best of 2011: Our favorite lists about nurses! It’s debatable exactly where “sense of humor” falls in the list of top essential nurse traits. We at Scrubs definitely areÂ putting it somewhere in the top ten! We owe so many laughs to you, our readers, for submitting some of the funniest lists in our archives. Here is a look back at our favorite lists! We asked a nurse to give us the lowdown…and the highlights…of the people that you meet each day. Regardless of their specialty, these are the men and women who stride through the halls in professional dress (or, at the least, business casual). They look well-rested and are generally fit and well-nourished. After a few years’ experience, you’ll be able to differentiate psychiatry attendings (comfortable shoes, dangly necklaces) from orthopedic attendings (cowboy boots, bags of Cheetos in their pockets) from internal medicine attendings (silk ties, expensive heels). Please note that in teaching hospitals, these are the people with either no white coats at all or very long white coats, usually with frog closures rather than buttons. These are the men and women who shamble through the halls, one step up from zombification. They look exhausted (and generally are) and as though they’ve been wearing the same scrubs for several days (and generally have been). After a few years’ experience, you’ll be able to differentiate neurosurgery residents (they get the in-jokes about Starfleet Academy) from urology residents (who have the grossest stories) and dermatology residents (the only rested ones in the bunch). Please note that in teaching hospitals, these are the people with mid-length white coats. The length of time each person has spent in residency can be determined by the following formula: The amount of stuff in the lab coat pockets is inversely proportional to the year rank of the person wearing the lab coat. Get the full list of hospital personalities. How many times have we been tempted to say something like this to a visitor or patient who dismisses you and asks to speak to a doctor? Do you want to speak to the doctor in charge, or the nurse who actually knows what’s going on? 2. Did he really ask me that? It’s said that ignorance of the law is no defense—but how do we know we’re breaking a law if we don’t know it exists? Luckily, we do know the serious laws, particularly those that have to do with practicing nursing. We know about HIPAA, that diverting narcotics is a Bad Thing, and that we can’t strangle a visitor who is getting on our last nerve. But there may be other laws with which you might not be familiar. So, to further your legal education, we are going to share a few laws from here and around the world—you just may be spared a trip to the police station. 1. You can’t be an obese nurse in Japan. If you’re considering moving to Japan to try your hand at nursing, you may want to check if foreigners are included in the two-year-old law that bans the Japanese from being fat. In 2008, the Japanese government decreed that its citizens had to slim down to reduce the chances of developing lifestyle-related diseases, such as metabolic syndrome—or metabo, as they call it there. 2. Mercury thermometers aren’t disposable. It’s not likely you would find mercury thermometers or sphygmomanometers in most hospitals these days (unless you’re looking at a historical display! ), but you could come across them while doing home healthcare or if you’re working in an underprivileged part of the country. Unfortunately, because these devices are made of glass, they can break easily and must be disposed of safely. If you do find a broken mercury thermometer or blood pressure machine, do not throw these items or any loose mercury in the garbage. It’s illegal in the United States to dispose of mercury in the trash or in recycling. It must be brought to a hazardous disposal unit. 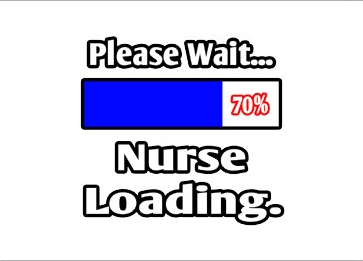 Have you seen any great nurse bumper stickers? Here are our top 10 favorite decals found on zazzle.com. 1. Working in an emergency room, you see all sorts of stuff you want to place in the “What on EARTH were they thinking?” file. Now there’s a bumper sticker just for you: Trauma Nurse: Your stupidity is my job security! 2. 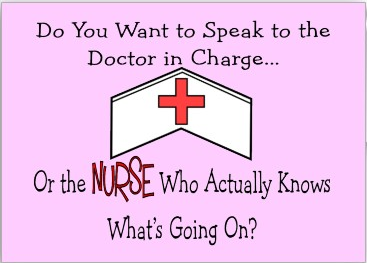 Both emergency room and OR nurses should identify with this one. Who hasn’t felt like they’ve had to do this at one time or another: Nurse: Putting the Pieces Together. See all the bumper stickers. Nurse-doctor romances, extreme stereotypes and crazy inaccuracies—yep, sounds like your typical medical movie to us! We asked our Facebook fans to come up with the title for a romantic comedy starring a nurse. Check out the hilarious results below! Synopsis: A gorgeous nurse discovers a basement bedpan. Little does she know that there’s more to this enchanting bedpan until she discovers it can tell her fortune! Synopsis: A beautiful nurse has such an impeccable bedside manner that all the patients have fallen in love with her and refuse to give up their beds. Synopsis: An overworked charge nurse’s husband has had enough of never seeing his wife! Hilarity ensues when he schedules her for mandatory overtime…in the bedroom!